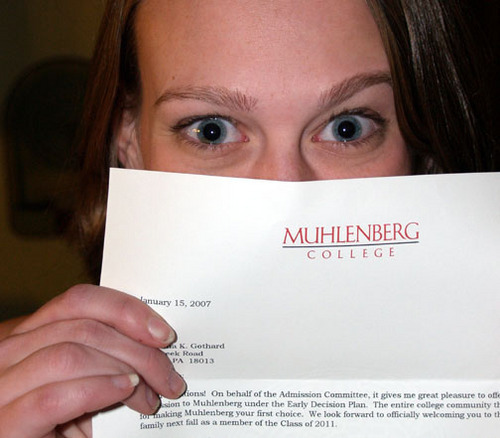 My daughter recieves the early decision acceptance letter to the college of her choice. Her criteria for choosing a school was that it be small, with a strong sense of community, and provide a well rounded education. the priority, of course, for this passionate & gifted young woman (gush), is that it have an outstanding theater program. We were advised by faculty at NYU & Rutgers (without knowing where we lived) that this Pennsylvania college was one of the best for musical theater and drama. And so the journey begins. Hey, way to go, man! Great news. Your and Zimm's daughters are forging ahead. Gotta be a relief that this process is now over with for you guys. You said it, Robert. Then in two years we revisit the process with our son. Kudos to you and your daughter, David! Her eyes say it all. Congrats! Don't know if you had the same expenditure of energies marshalling your sprout through the maze that kids have to go through these days to get into school that we did, but its a real landmark. It deserves celebration. Well done! That's so great. That's a great photo too. In her eyes is real excitement and vibrancy. I know those eyes though, they are bit like yours, but of course so pretty here :) Congrats dad. Congrats. I've also heard that's a good school for theater. David, Anna, Today is Gothard Congratulation Day! Congratulations to daughter and folks! Congratulations Anna! I think it's a huge life lesson, what you just accomplished. Ask for exactly what you want. Most of the time, you'll get it if you deserve it. Ask for less, and you'll get that too! You go! DG and Anna, Congrats! Great that she's doing what she really wants to do. That alone will take her wherever she wants to go. My parents didn't speak English, so I just applied wherever I wanted to go and did all the paperwork myself. They stayed out of it. Which led me to....Pratt. David, How exciting, and to not be too far away is great for the family. My youngest will be leaving next year to who knows where.